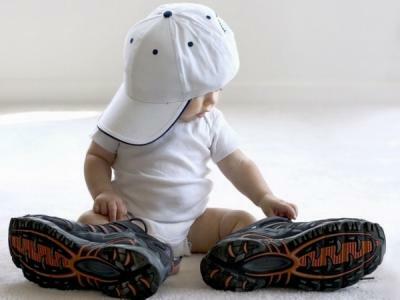 Buying a baby or toddler their first pair of shoes is an important milestone, and one that needs a lot of time and care devoted to it, to make sure your child’s feet develop properly as they become more confident in their walking ability. Children’s shoes are very important as the feet are still growing, made up of gristle and cartilage, until turning into bone around the 18 month mark. By the age of five, the 22 foot bones a baby is born with have become 26. This means the shoes worn between these ages are crucial, not only for how a child’s foot develops, but for how they walk. The wrong pair of shoes can alter a child’s walk by putting pressure on certain parts of the foot making the child walk with their knees or ankles at unusual angles, which can affect the way they walk for the rest of their life. The decision to buy a child their first shoes shouldn’t be rushed into. Children don’t need shoes until they are regularly walking outside, unsupervised, and the purchase of a first pair of shoes is important to protect the feet. It is best, though, to let the feet develop as much as possible before adapting a child to regular shoe wearing. Shoe sizes for children aren’t standardised so it’s very important to get shoes fitted in the shop. An expert fitting is usually done free by a retail assistant in a shoe shop, who will be able to tell if the child is walking properly as they try the shoes on and test them out in the shop. The child should get re-measured for shoes often, and multiple pairs should be purchased for different uses, such as plimsolls for sport, structured shoes for walking and wellington boots for rainy weather. It’s key to get a child used to different shoes for different purposes, but at this young age, the different purposes of shoes are really important. You shouldn’t ask a child if their shoes are comfortable, as they are unused to walking in shoes so won’t be able to give an accurate answer on whether the shoe fits their feet, and will often say they are comfortable if they like the design of the shoes. Fun designs however are a great way to help kids get used to wearing shoes. Trainers with lights are forever popular, and colourful designs on baby shoes always go down well. Designers such as Starchild have done a fantastic job of for helping toddlers to enjoy their shoes whilst getting the right support. Victoria Gray is a professional blogger and freelance writer. She enjoys writing on a variety of topics from lifestyle to home and family, and her work has been published on a number of successful websites.